Habitat Environmental investigates complaints of potential exposures to household dust mite and animal allergens. We perform sampling for individual or multiple types of allergens, as required by a specific concern. A test panel is provided as a cost-effective option when more than one allergen exposure is suspected. We encourage our clients to share their physician’s information so the investigation can be designed accordingly. Testing is available for dust mite, cat dander, dog dander, cockroach, and mouse allergens. 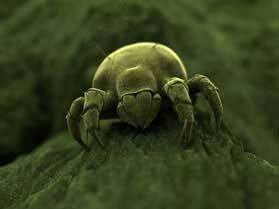 Dust mites are microscopic creatures that can travel through the air and are too small to be seen to the naked eye. They prefer warm, moist surroundings close to sources of food. Since they feed off dead skin cells from humans, they are most prevalent in high-use areas such as living rooms, bedrooms, and areas with upholstered furnishings where shed skin scales can collect and serve as food. Dust mites, like other biological contaminants, contribute to poor indoor air quality and can cause adverse health effects. Allergens are biological or chemical substances that can cause the human body to develop a specific immune response with each exposure, even when exposure levels are low. Hypersensitivity diseases caused by allergens from mites that live indoors constitute a major health problem in the U.S. and elsewhere. House dust mites are primarily a concern in human dwellings, but dust mites and mite allergens have also been identified in office buildings. Dust mite allergens are considered to be the major biological agent to have sufficient evidence for the causal relationship of their exposure to the development and exacerbation of asthma in susceptible children. Cat and dog allergens are everywhere. Pet dander is even in homes never occupied by these animals because it is carried on people's clothing. The allergens get in the air and stay suspended in the air for long periods of time due to their extremely small size. This facilitates entering the respiratory tract, causing the allergic response such as asthma. Cockroaches and mouse allergens can also contribute to inducing allergies in the indoor environment.